National Left: A royal palace in Wales.? WTF! Royal Sychophant broadcaster Brian Hoey said a new residence would be a "wonderful idea". 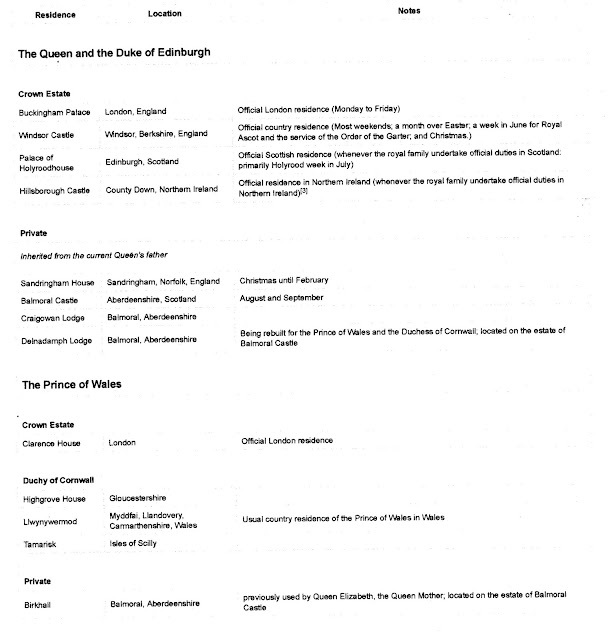 According to the BBC Gorwel's report (Which you can read here) examined the case for and against setting up a royal palace in Wales to match those elsewhere. Doing so would give Wales political and economic benefits, it argued, leading to a long-term increase in tourism numbers and create up to 100 jobs. The report suggested between £765,000 and £3.6m annually could be generated in tourism income, as well as a further £510,000 - £2.4m in indirect spending with between 55,680 and 266,927 visitors a year. Presumably this would be a net [profit after security and running costs are taken into account. Even if all of this was placed on the UK taxpayer rather than the Welsh the alleged profit seems negligible. The report was not specific about what kind of building should be used, but said a new site would be "more interesting than a building that had been there for many years already". 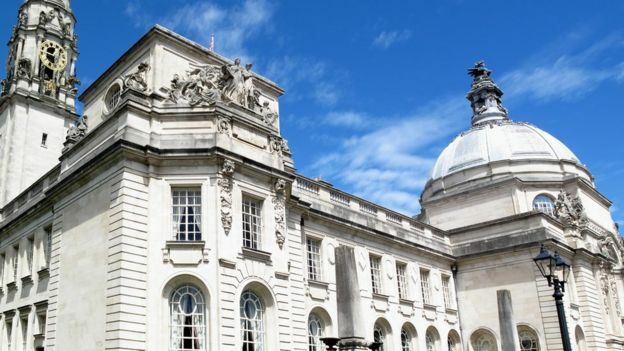 It also suggested a number of older buildings could be adapted for use in and around Cardiff, including City Hall and Duffryn Gardens. But the report's authors, Prof Russell Deacon and Scott Prosser, also list potential drawbacks including that it could be seen as extravagant during a time of austerity. They said it could also distract or displace tourism for other sites and was "unlikely to be a substantially profitable enterprise". There would also likely be "significant costs" in renovating an existing building or establishing a new one, while security and anti-terrorism measures "could act as a substantial drain on the public purse". If we took Cardiff City Hall then I assume some kind of permanent perimeter fence would have to be built around the building or at least an exclusion Zone when the Monarch graced us with a visit. Bearing in mind it stands next to the National Museum and has University departments close by it could cause major disruption. "There are a number of royal events coming up, which benefit other capitals, such as London and bring in increased tourism there. "We'd like to see whether royal occasions could also benefit Cardiff, why is Wales left out of that tourism bonanza? Perhaps we should share some of that as well, we're part of the United Kingdom and in that respect we should have a royal residency here too." "If there were to be a royal residence here in Wales, it would increase the profile of Wales not only throughout the United Kingdom, but throughout the world. "Because we would then be on the same standing as Northern Ireland and Scotland, and other parts of England of course." There are official royal residences in England - including Buckingham Palace and Windsor Castle - Scotland has the Palace of Holyroodhouse and Northern Ireland has Hillsborough Castle. The Prince of Wales has a private estate in Llwynywermod in Carmarthanshire, which is often used commercially for holiday lets. I think that's enough . "We've already got 600 castles in Wales, we've already got mountains that bring people here. I think the tourism benefit is hugely exaggerated. "I don't think the royal family need another home, they've got plenty. If they want to build something in Wales, they should build social housing." Of course this has nothing to do with tourism It is like the renaming of the Second Severn Crossing part of an ongoing strategy to tie Wales to the Union. The bridge naming fiasco may have backfired, but it in itself is part of policy to split Wales into a South under the dominance of a Greater Bristol and the North under Liverpool. "other parts of England" - is this Hoey eejit claiming that Scotland, Wales and Norn Ireland are parts of England? Is he claiming Wales alone is another part of England? either way - NO, NO, NO and NO. £36 million sounds good when you read the headline. But on closer reading it is £3.6million a year. Not quite so good. Then buried in the article we see that much of that money comes from other attractions in Wales. So there are job losses for some so that a palace can be built that will be used a few times a year. Now if that was the headline there would be another petition that would be quickly gathering thousands of signatures. Why stop at a Palace? Think of the tourist revenues a series of new castles dotted around Wales would bring in. And they'd have the added bonus of helping to keep those uppity welsh people in their place too!